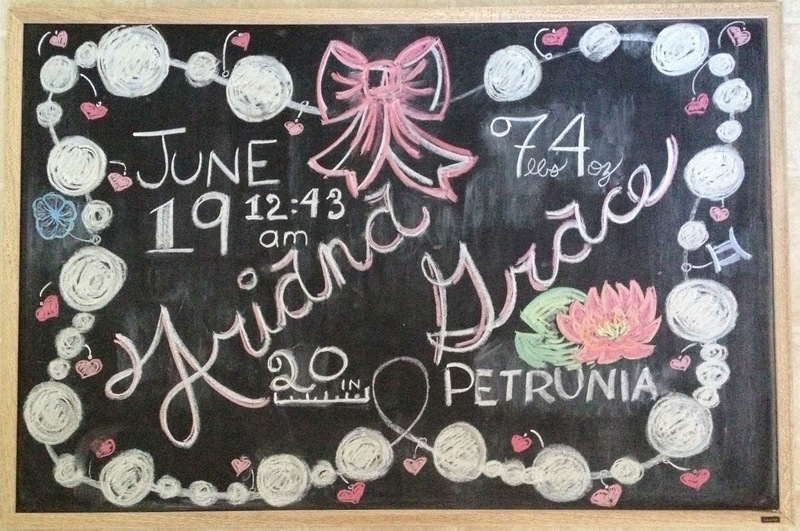 If you’re looking for a beautiful & unique way to commemorate the birth of your baby or other special milestones (ie first 12 months, 1st birthday or 1st day of school) creating a chalkboard backdrop is a fun & beautiful way to do it. The great thing about this medium is how user friendly it is- you can erase and re- do it as many times as you want- plus it can be as permanent or temporary as you see fit. During my pregnancy I created monthly chalkboards to mark the progress and jot down fun info about how big the baby was, cravings, and other changes that had occurred over the previous weeks. It was fun at the time, and I still look back at the photos and enjoy watching my pregnancy progress. Since having Ari, I’ve kept up the tradition first by creating a chalkboard backdrop for her newborn photos and then to mark her monthly ‘birthdays’. I took inspiration from (where else?) Pinterest to help me decide what I wanted to include and give me some design inspiration. I was really happy with how it turned out (see above), and it was really hard to erase it to make room for her first monthly photo shoot (I kept the bow at the top because I couldn’t bring myself to completely erase such a special token of my daughter’s first few weeks). My poor hubby had to endure quite a few hormonal tears when I erased my last pregnancy month & Ari’s fancy birth announcement background; it really is true what they say about how time flies! I know some of you may not feel artistically inclined, but I can promise you that you don’t have to be Picasso to create a beautiful piece of art to help commemorate these special times with your little one- both before and after they make their debut into the world. – what is baby doing? – did baby pop a tooth? roll over? start solids? etc.